City Council has voted to protect 303 potentially significant buildings downtown. Demolition of designated buildings within the King-Spadina neighbourhood can now be rejected by city staff. In 1996, only 945 people lived in this then-industrial area. Today 19,000 live here, and with new development that number of residents and employees is expected to rise to 50,000. 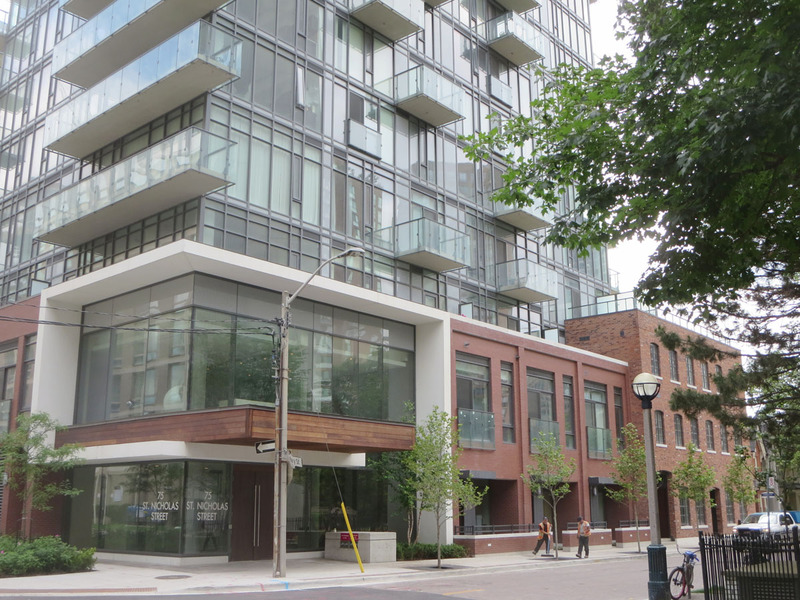 Developers can appeal to the quasi-judicial, non-elected Ontario Municipal Board. The final council vote was 30 to 1 in favour. Who cast the one dissenting vote? Councillor GIORGIO MAMMOLIT1 (Ward 7 – York West), still smarting after a dressing-down by Mayor JOHN TORY two days earlier. 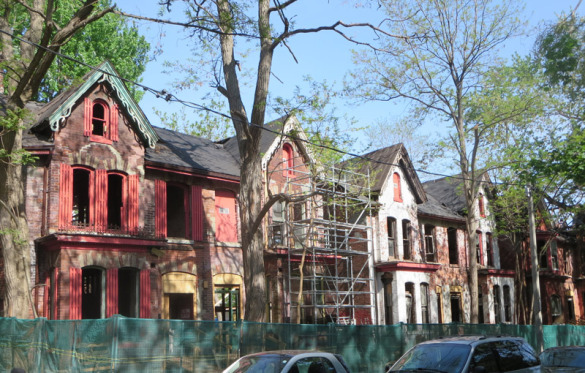 Fortunately some TORONTO developers are finding ways to save the old, while building the new – as opposed to the ‘tear ‘em down and start over’ approach. 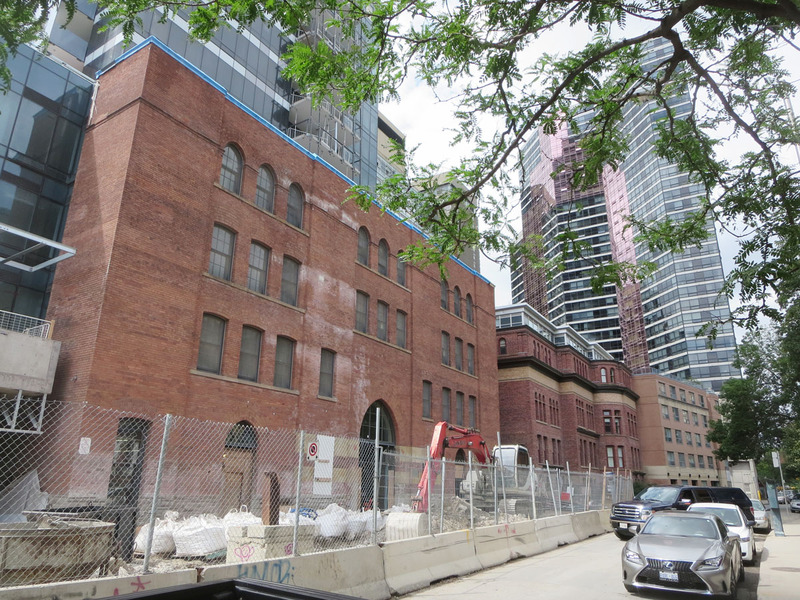 <PHOTO ABOVE> – a development on St. Nicholas Street at St. Mary incorporates an elderly warehouse with a new condo tower. <PHOTOS BELOW> – late 19th century commercial buildings on Yonge Street; Hariri Pontarini Architects. 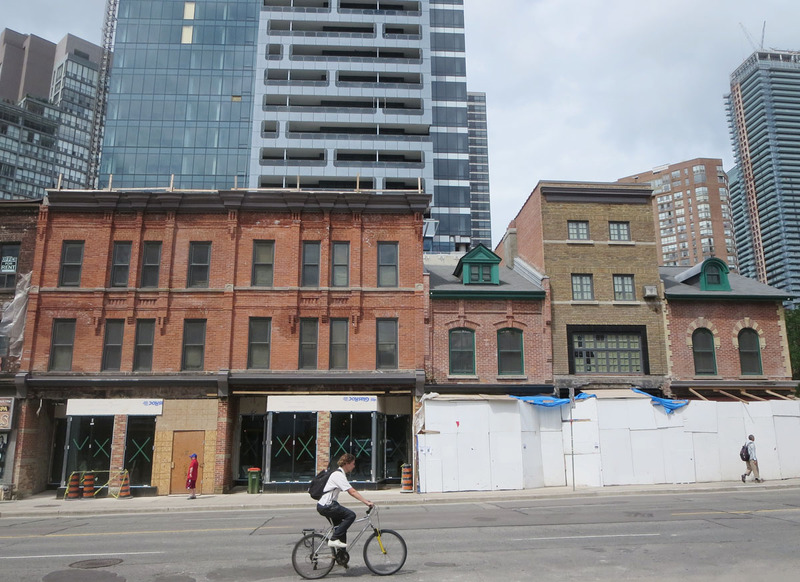 A new 48-storey modern tower behind incorporates a half-block of low brick buildings on Yonge with a couple of warehouses dating back to 1905 around the corner on St. Joseph. The historical preservation involved restoration of the Yonge Street frontage, new windows, roofs, storefronts and cleaning of the brick facades. The finished project below. 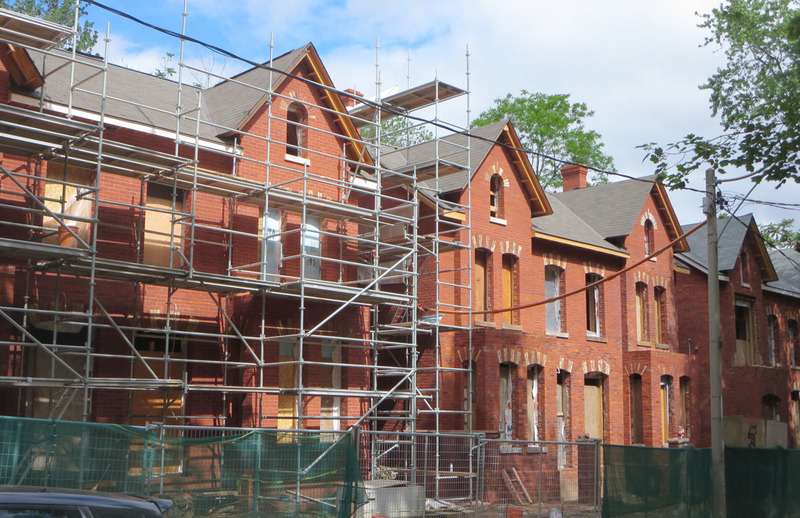 After about 45 years of neglect, an abandoned row of downtown heritage brick houses is on the road to recovery. The Glen Road homes sit a few hundred metres from upscale Rosedale to the north, and the towers of St. James Town to the south. Where Yonge Street meets Bloor is one of Canada’s prime intersections. 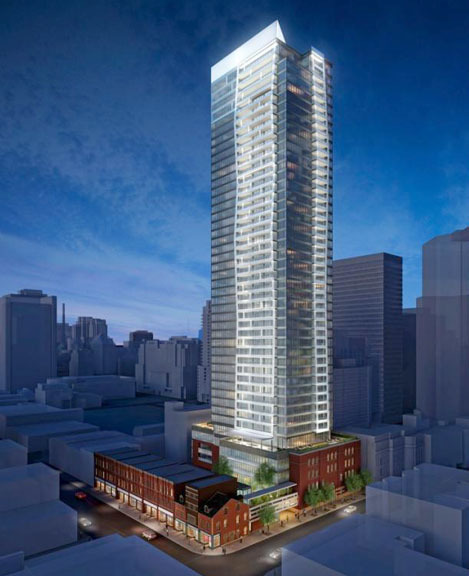 If the proposal is approved, a tower (The One) – Canada tallest – designed by LONDON-based Foster and Partners and TORONTO’s Core Architects will rise on the southwest corner. The plan was sent back to the drawing board. In TORONTO, downtown-dwelling millennials now make up close to half the population. 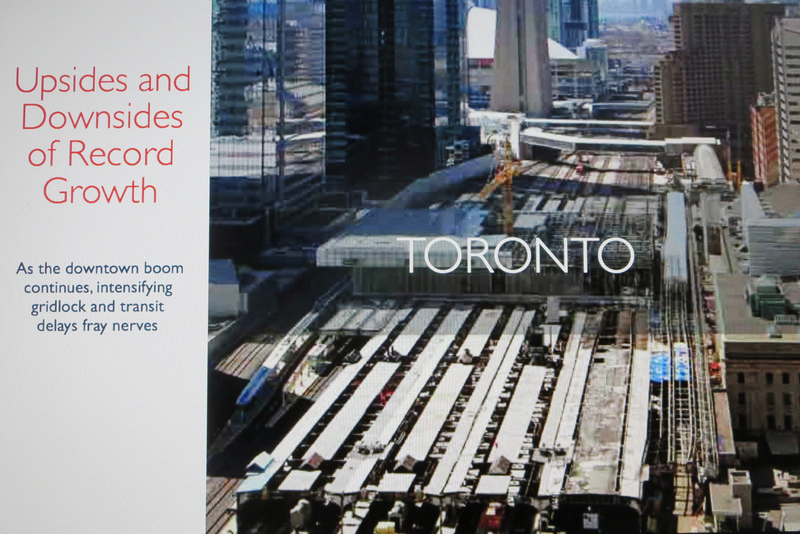 They’ve largely abandoned cars, take public transit, have fuelled new office and condo development, and are driving urban renewal in Canada’s largest city. In a 10-city study by commercial brokerage firm CUSHMAN & WAKEFIELD, city cores from Mexico City to Manhattan, Chicago to Washington, Boston to San Francisco, Miami to Atlanta, Los Angeles to TORONTO are exploding with an influx of millennials (those born between the early 1980’s and late 1990’s. They want to live close to work and the action. Because of gentrification and the high cost of housing in the core, some families and the urban poor are being forced to move further out to the fringes. 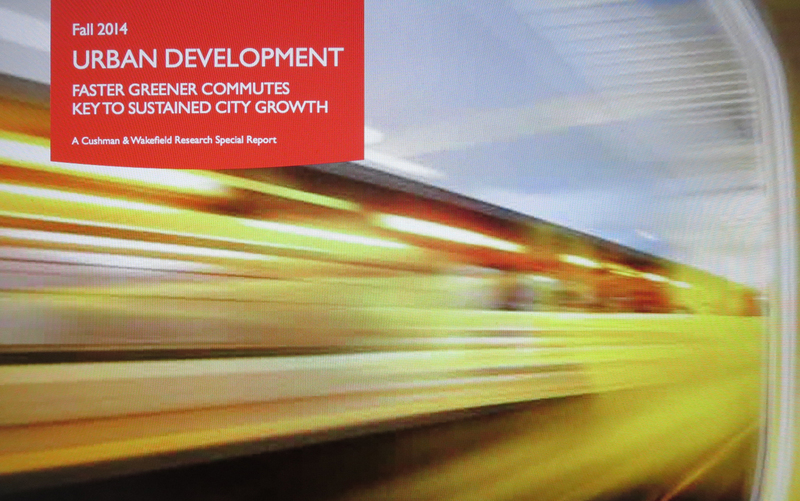 Critical transit improvements are needed in most of the world’s major cities. They’re being hobbled by red tape, too many impact studies, NIMBYism and a lack of funding, the report says.